Home > Automotive Belts > Automotive Serpentine Belts. 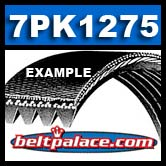 PK, K Section Poly V > 7PK1275 Automotive Serpentine (Micro-V) Belt: 1275mm x 7 ribs. Metric 7PK1275 Serpentine Belt. 50.2” (1275mm) Eff. Length. 7PK1275 Automotive Serpentine (Micro-V) Belt: 1275mm x 7 ribs. Metric 7PK1275 Serpentine Belt. 50.2” (1275mm) Eff. Length. CURRENTLY OUT OF STOCK: CONTACT US FOR AVAILABILITY! 7PK1275 Automotive Serpentine (Micro-V) Belt: 1275mm x 7 ribs. HEAVY DUTY Automotive Serpentine Belts (Micro-V): PK (K) Section. Metric 7PK1275 Serpentine Belt. 50.2” (1275mm) Effective Length, 7 Ribs. BANDO USA “PK” Premium Series Automotive Serpentine (Micro V) ribbed belts are designed to replace OEM belts on extra heavy-duty passenger car and truck applications: 7PK1275 air conditioner belt, Nissan (European) 7PK1275 Serpentine Belt, fan belt 7PK1275 and more. AKA: DV7-PK1275 Belt. Nissan fan belt 7PK1275. Also: Nissan 11720EB300, Nissan 11720EB30A, Nissan 11720EB310, and 11720EB70C.